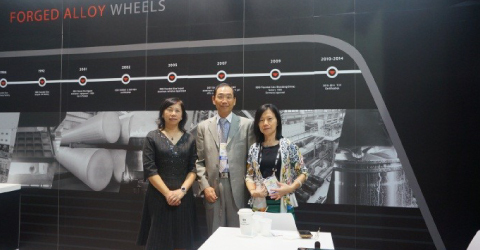 The foremost non-profit trade and investment promotion organization in Taiwan, the Taiwan External Trade Development Council (TAITRA), will be leading 53 Taiwanese manufacturers to attend AAPEX 2017. The show will be held at the Sands Expo Center in Las Vegas from Oct. 31 to Nov. 2, 2017. AAPEX, also known as the Automotive Aftermarket Products Expo, is the largest automotive aftermarket products exhibition in North America. This year, the show is expected to be joined by 2,200 exhibiting companies and 158,000 automotive aftermarket professionals from more than 140 countries. The group of 53 Taiwanese companies led by TAITRA will be exhibiting at the Taiwan Pavilion, located at Lobby Level 1 of the Sands Hall. On display will be their latest breakthroughs and innovations in the field of automotive products and technology. The automotive industry of Taiwan is one of the best in the world, and Taiwanese manufacturers have long been globally recognized for their high product quality and extraordinary service flexibility. Visitors can also make advance appointment bookings with the exhibitors from the website. The national B2B trade portal of Taiwan, Taiwantrade.com, will also be exhibiting at booth number 7920 of the Sands Expo & Convention Center, where the visitors will be introduced to the many useful sourcing services provided by the online portal. The Taiwantrade.com booth will also introduce the visitors to the webpage auto.taiwantrade.com with the company profiles of 3,784 Taiwanese suppliers and 43,095 product catalogs. You are cordially invited to visit the Taiwan Pavilion at AAPEX 2017, located at Lobby Level 1 of the Sands Hall across booth numbers 8003~8107, 7819~7821, 7919~7920, 8019~8026, 8119~8126, 8028~8032 and 8128~8033 of the Sands Expo Center in Las Vegas from Oct. 31 to Nov. 2, 2017.